My story about renewable energy sources begins in 2006 when I bought my Volkswagen RV/camper. At the end of summer that year I bought my first renewable energy source — the first solar panel. 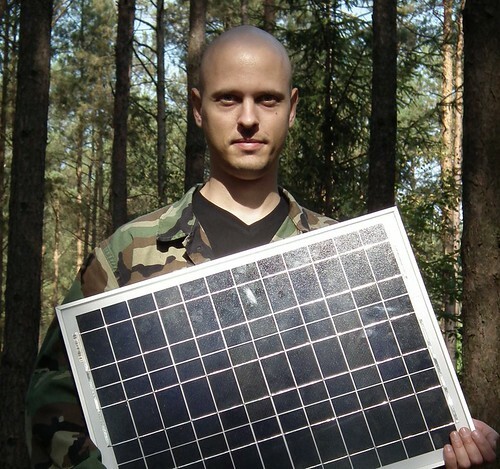 I wanted it to be a off-grid energy source for my first camping holidays, but only found out that such panels have many disadvantages. The panel I bought was rated at 10 W and 12 V. I connected it to an unused old car battery to store the solar energy, using a charge controller. While we were driving, the battery was charged from a lighter socket, and on the campsites I used the lighter plug to connect the controller to the solar panel. That’s right — the panel has a lighter socket that allows it to be used directly, without any battery.